The Chargers have more off the field trouble, as linebacker Shaun Phillips was cited for misdemeanor battery for allegedly striking a security guard in the face at a downtown hotel early Sunday morning. It’s the second time in three seasons that Phillips has had issues with police. The LB was not arrested according to police, but was cited by an officer at about 1 a.m. The report says a security guard at the Ivy Hotel reported that he had been struck in the face. The security guard was identified as Robert Van Cleave of Pacific Beach. “It’s disappointing to hear about the issue involving Shaun Phillips. We’ll continue to monitor the situation and let the legal process run its course,” general manager A.J. Smith said in a statement. Phillips was arrested in April 2006 for went back and forth with a police officer in downtown but wasn’t charged. 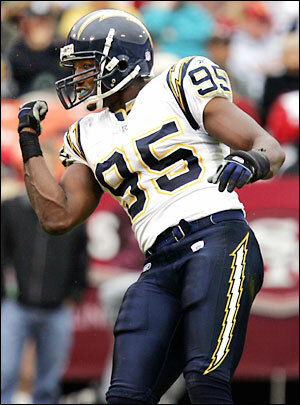 Last season Phillips led the Chargers with 7 1/2 sacks.